Payment options for online bookings are either via bank transfers(EFT) or if you prefer to pay with a creditcard, please send us a quick email after online booking was made to indicate that you would like to pay with a credit card. 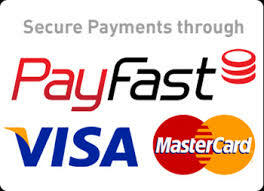 We will send a secure PAYFAST or Masterpass link, for you to enter your creditcard details. (Please indication your your preference) The link is able to process MasterCard and Visa credit cards, as well as debitcard payments. Contact our reception for more information. Credit card and debit card payment facility are available at reception.